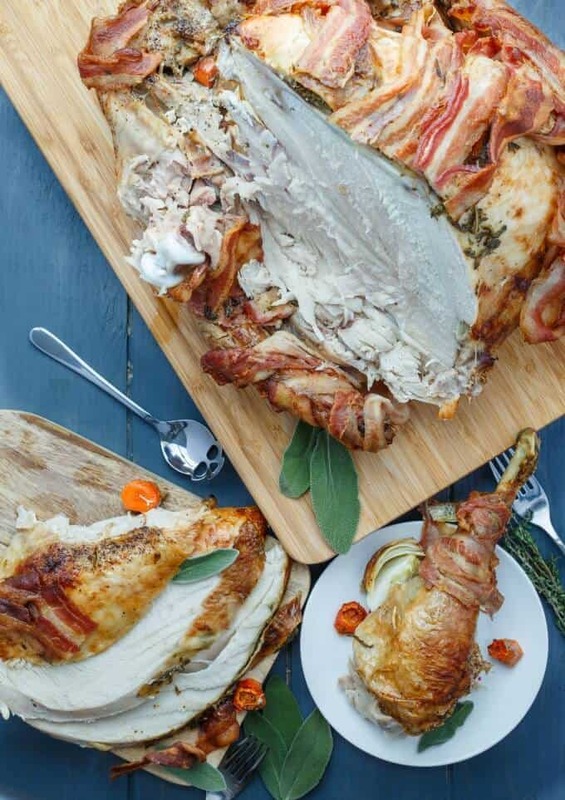 With the crazy summer temperatures we have been having, you would never guess Canadian Thanksgiving is just around the corner. I also feel Canadian Thanksgiving does not get the love like American Thanksgiving. 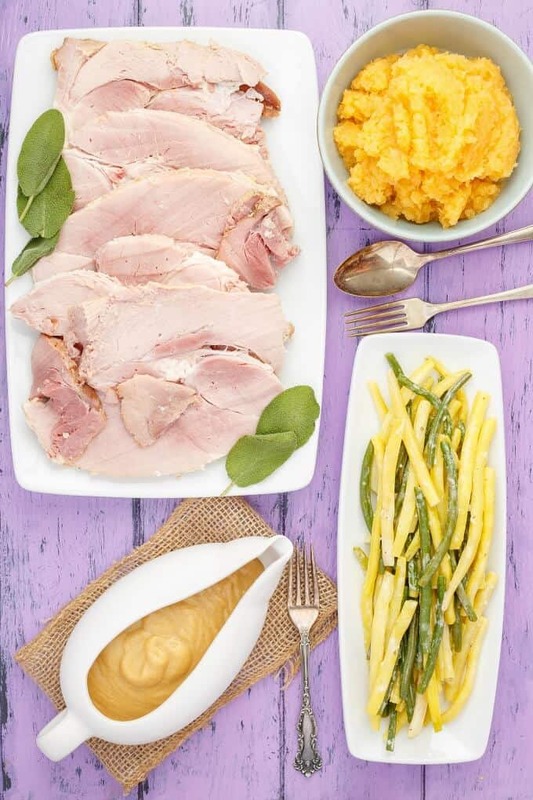 Unlike my slow cooker honey-garlic ham, this recipe utilizes a larger cut of meat that is bone-in. Bones are great for providing flavour, and awesome to use again for broth or soups 🙂 And you bet I did not let that bone go to waste here! Feel free to checkout my slow cooker pea-potato soup recipe if you need some inspiration on how to use up leftovers. Well, you will be blown away with how flavourful this sauce is! As the ham is resting, move all the contents from the slow cooker into a large saucepan. Simmer for a short bit to help concentrate those flavours, adding water if necessary. Move everything to a blender and puree until smooth (adding more water until you achieve the consistency you desire.) 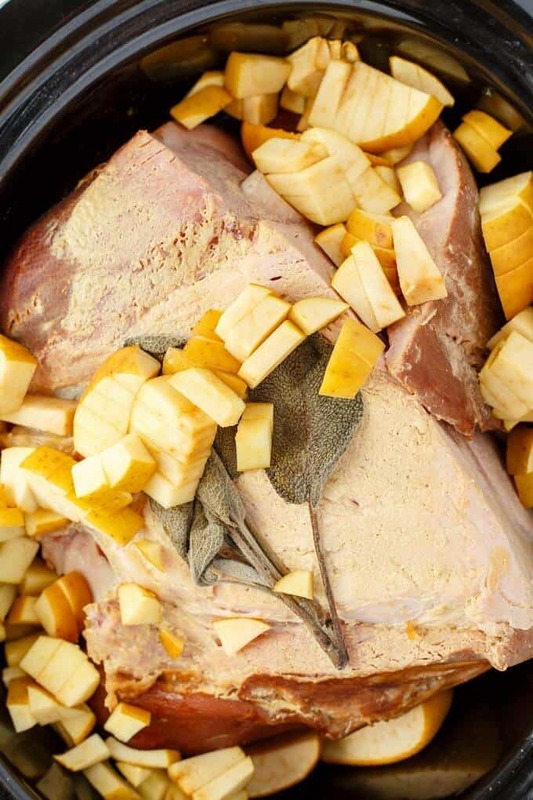 The apples add natural sweetness alongside the honey, and help balance the saltiness of the pork. Seriously, it is almost like a salty-apple gravy! 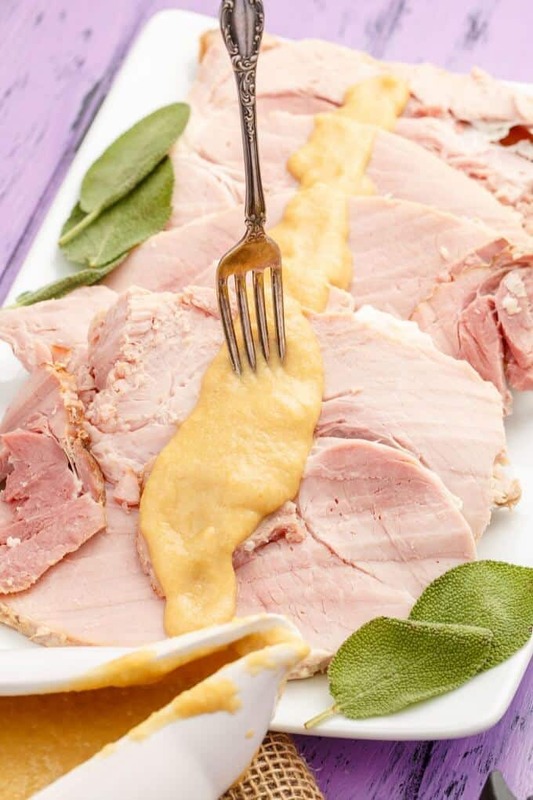 As always, I want to point out that this slow cooker honey-mustard apple ham may differ in cook time for everyone depending on their slow cooker. Don’t go too big as you won’t be able to close the slow cooker 🙂 I had to trim mine a bit to fit, but no big deal. 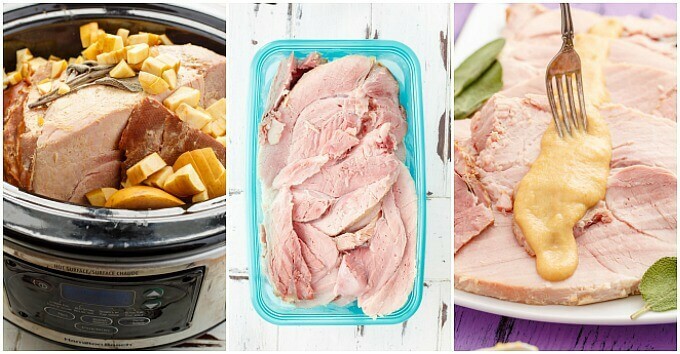 Ham is the perfect meat for the slow cooker! Free up that oven space! 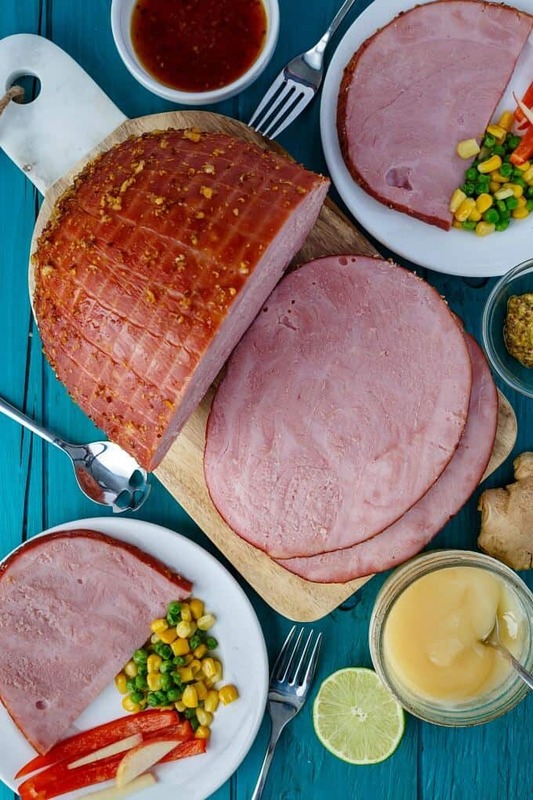 Place ham into 6-quart slow cooker, trimming if necessary. Combine honey, mustard, Worcestershire, garlic, and black pepper. Pour over ham evenly. Top with sage leaves. Allow to rest, slice, and serve! Pour all contents (except ham) from slow cooker into a large frying/saute pan. Bring to a boil over medium heat. Simmer for 10 minutes, or until slightly reduce. Toss sage leaves. The "gravy" is super simple and easily customized! Add water in small amounts as you cannot take away if you add too much 😉 You can also add all the apples at the beginning of cook time, but the above method leaves a bit of firmness to the apples if you do not desire the "gravy." 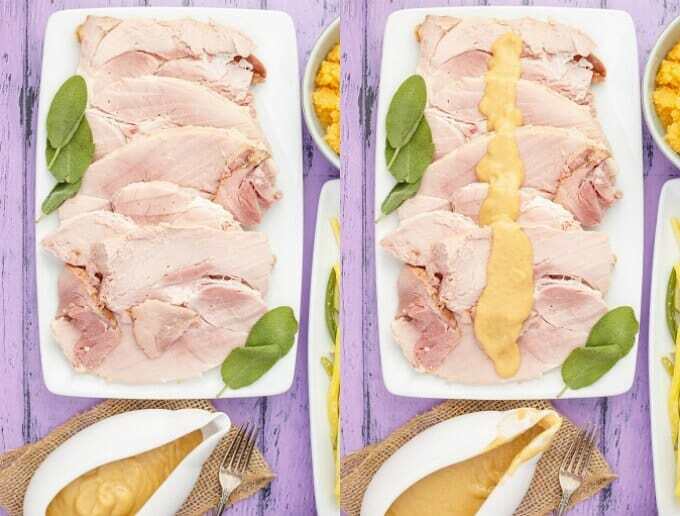 See those side dishes alongside this honey-mustard apple ham? They will be coming to the blog in the next few weeks so you can prepare one awesome meal from one awesome blog 😉 I’ll update this page when those recipes go live so you do not have to search.